We have filed complaints with the Department of Labor's Wage and Hour Division and called for an investigation of systemic and serious wage theft by GDIT at 11 call centers where we provide assistance to callers about Medicare and the Affordable Care Act under a contract for the Centers for Medicare and Medicaid Services (CMS). The New York Times published this story about our complaint against GDIT for wage theft. "I've had two rounds of extensive training to get to my current job. It's a lot of responsibility and a lot of work. But I'm being paid at a much lower rate. I'm being cheated, and the federal government must hold GDIT accountable. GDIT needs to follow the contract it agreed to," he said. Kathleen Flick is part of the internal support group at the Bogalusa, Louisiana, call center. She said that GDIT's wage theft "makes me feel horrible. Stealing from the working poor is really low." In a separate development, National Labor Relations Board Region 5 has issued a complaint against GDIT for violating federal labor law and workers' rights at its Alexandria, Virginia, facility. GDIT workers visited legislators on Capitol Hill in January. Top photo, from left: Clifton Pollock, Kathleen Flick, Swannie Powe, Venus Nelson, U.S. Represenative Keith Ellison (D-Minn.), Sedgerick Lee, and Adrian Powe. 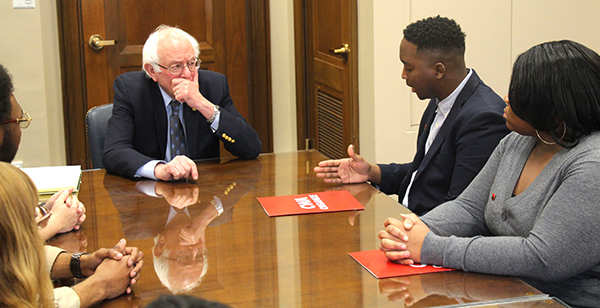 Below: Workers also met with Senator Bernie Sanders (I-Vt.).